Summer really is the time to break out the colour even if you’re more of a neutrals kind of person – hence this week’s #iwillwearwhatilike theme, a pop of colour! 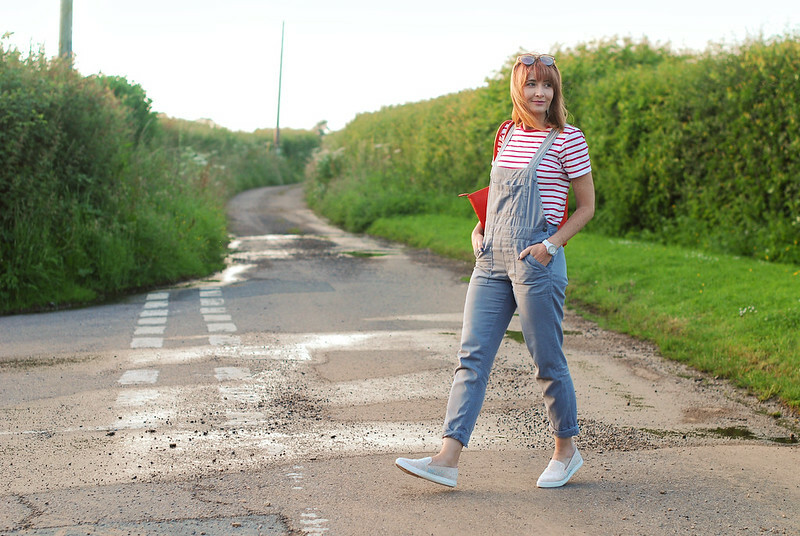 After my Grace Kelly-style wedding guest outfit last week I’ve done my usual trick of switching from super-glam to super casual in one fell swoop… Grey dungarees this week. The pop of colour comes courtesy of both a red Breton stripe top (I have so many Breton tops in all different colours and variations I’ve lost count) and my 2016 bag favourite: The Hobbs Adlington orange tote. This bag has gone with so many outfits this season and last, I have a feeling it’s going to be my go-to for a while yet. COLOUR – EVEN IN SMALL AMOUNTS LIKE THIS – IS SUCH A GREAT WAY TO LIFT AN OUTFIT. I DO FAVOUR NEUTRALS NOW AND THEN, BUT THE TEMPTATION TO ADD SOMETHING BRIGHT WILL NEVER LEAVE ME. Colour – even in small amounts like this – is such a great way to lift an outfit. I do favour neutrals now and then, but the temptation to add something bright will never leave me. A brightly coloured accessory – a bag, scarf or pair of shoes – is the easiest way to ease yourself into wearing more colour. So leave that black tote on the shelf and go for the red or yellow instead… You’ll not regret it! Finally: Must mention these gorrrrrrgeous embellished slip-on trainers by Miss KG (Kurt Geiger). I think the influence of my good friend The Sequinist is rubbing off on me – I just have to have everything sparkly right now. They’re super-comfy and such a pretty choice for a casual summer shoe. ARE YOU A FAN OF A POP – OR A DOLLOP(!) OF COLOUR? TELL ME IN THE COMMENTS OR TWEET ME @NOTLAMB! 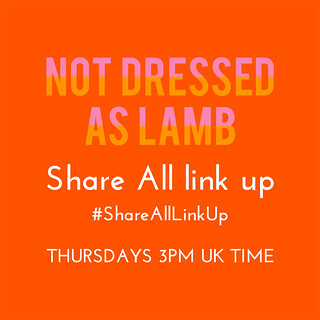 This is for linking up what you’ve been wearing (or would like to wear) only. I like to keep it all looking tidy because I’m a bit of a neat-freak, so non-outfit links will be removed – it’s only fair to others linking up! 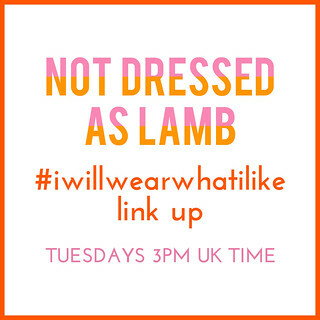 To get yourself featured next week, link up something following this week’s theme and make sure you’ve included a link back to Not Dressed As Lamb or my button in your post/sidebar! I love a pop of colour and use that in many outfits. I was going to upload the fuchsia poncho by Hope, but saw two fellow bloggers doing that. No problem finding something else. PS And I also like red/white breton stripes. 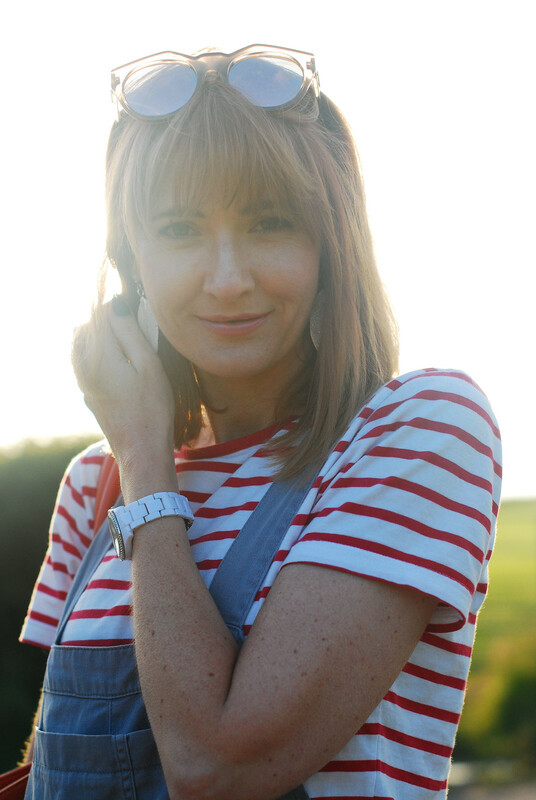 What is it with Breton stripes that we just can't seem to help ourselves, Emma?! 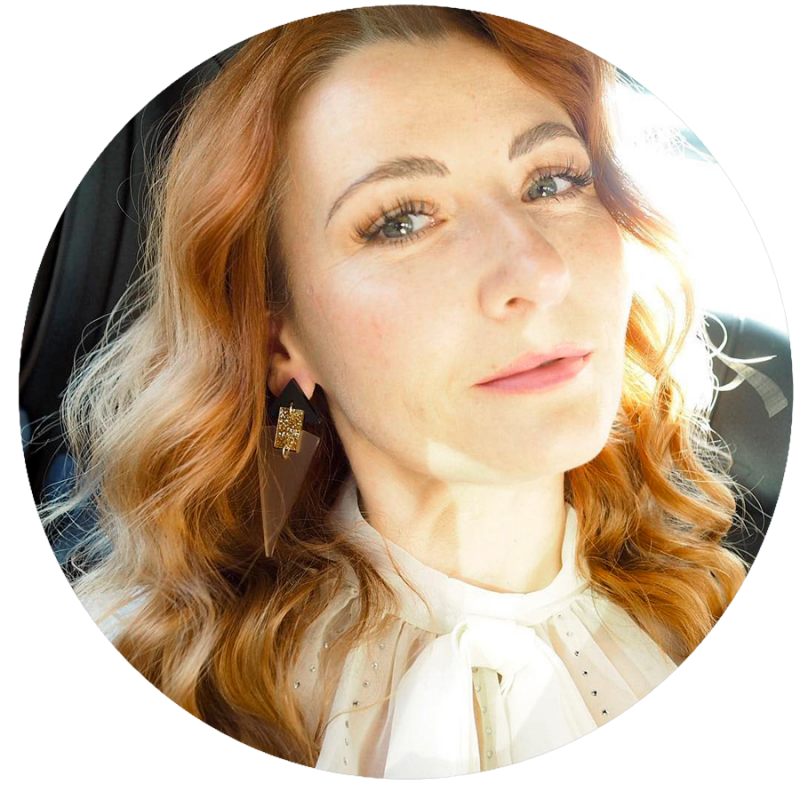 It always seems to be the one thing bloggers/women seem to have multiple versions of…!! I love these dungarees on you, Catherine! I'm still looking for my perfect pair lol! I actually found some yesterday but they only had one size left and they were a bit small … such a bummer! And they were in the sale for next to nothing. Grrrrr! Oh, almost forgot… thanks so much for featuring me!!! 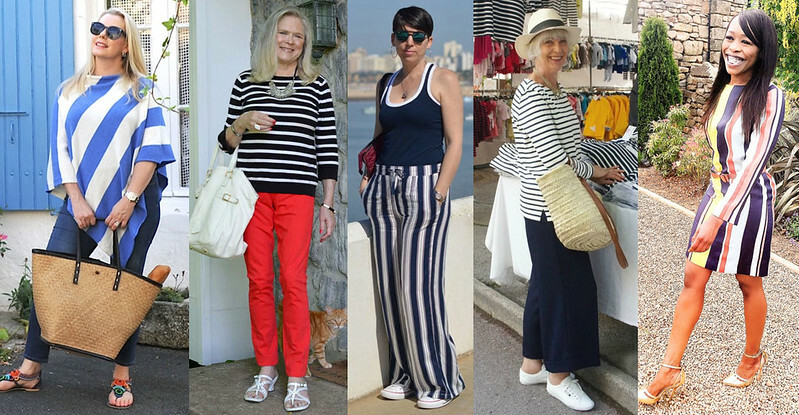 It was my pleasure to feature your lovely stripey pants, Suzy – and thank you!! 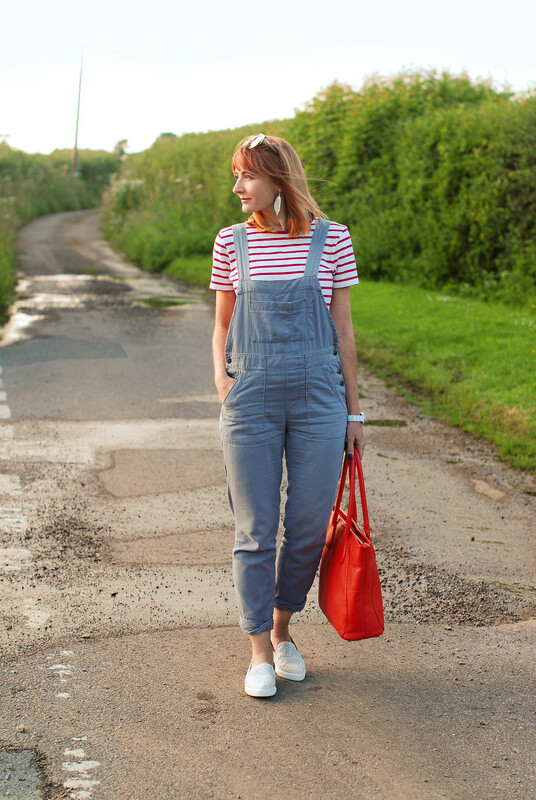 Those dungarees are so cute on you! I LOVE the pop of red with them too! MUAH right back atcha, Nikki!!!! Haha it may look warm, Monika, but it definitely wasn't – we had a family barbecue and sat outside shivering and wearing fleeces! If you look closely you can see goosebumps on my arms in some of the photos…! 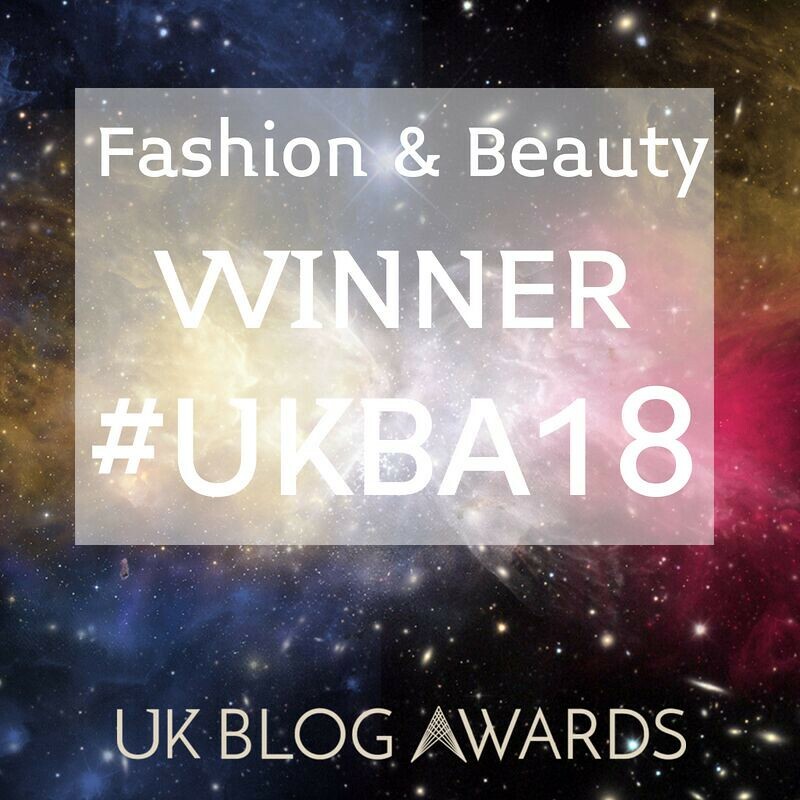 I do tend to go more for neutral tones instinctively but I like the idea of using colour as an accent there are so many lovely looks I am seeing inspired by the link up this week! 🙂 Those dungarees are fab btw! There's no such thing as too many striped tops! I'm a huge fan of a pop of color; it really does add a whole new dimension to an outfit. You're looking fabulous as always! You look so adorbs from top to toe! Come check out how I welcomed Summer in a boho-inspired look – Happy Tuesday! 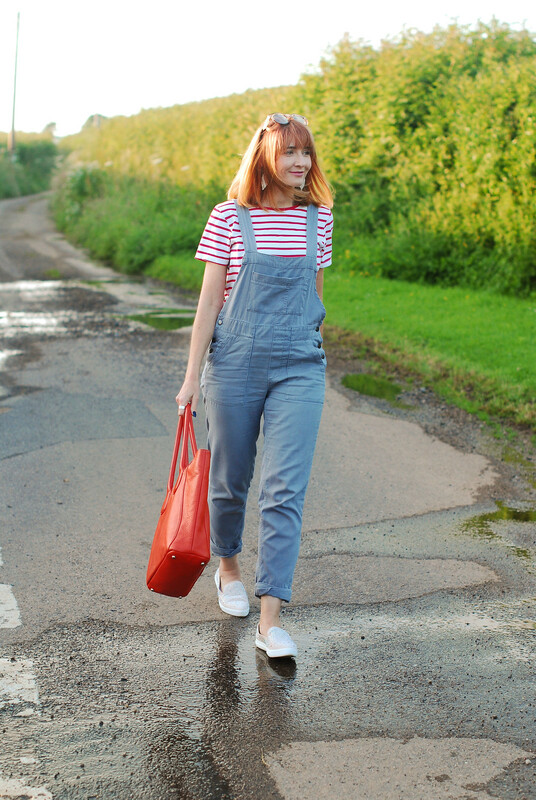 You look so cute in dungarees! Love the stripes and spot of color. cute sneakers too! I have not worn overalls for at least 20 + years, I love how your rock them so well! I adore this look, you look so young and carefree. Those shoes are so cute. 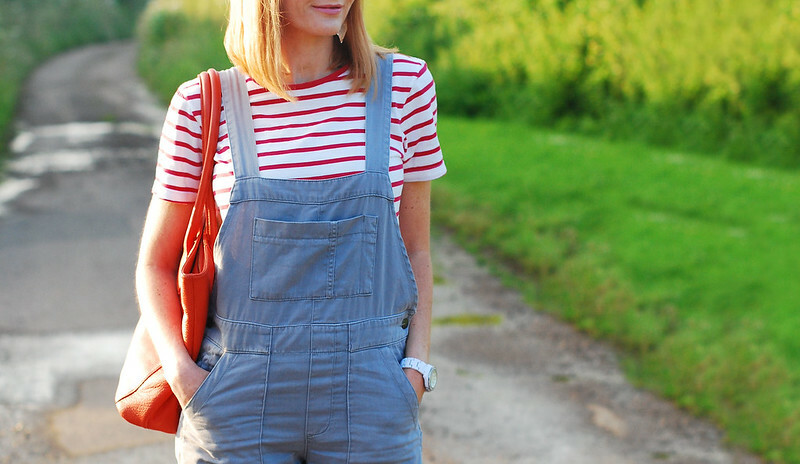 I'm not normally an overall girl but you make these ones look so adorably cute! Love it! p/s I'm actually that close to purchasing a bright orange bag myself!! Beautiful look with the pop of color from top and bag. 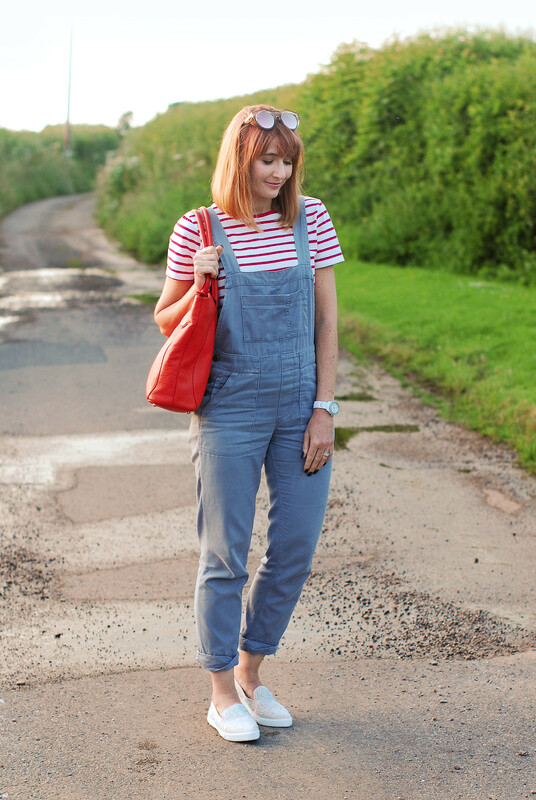 I love the grey dungaress, it looks a great with everything! Thanks for hosting the linkup. You've just convinced me to pick up the quilted yellow crossbody I've been eyeing! This is so comfy and chic, Catherine! I love a neutral outfit with a bright pop of color! And you can have never too many striped shirts… 🙂 Your bag is absolutely gorgeous; I can see why it's your favorite at the moment! Such an adorable outfit Catherine! 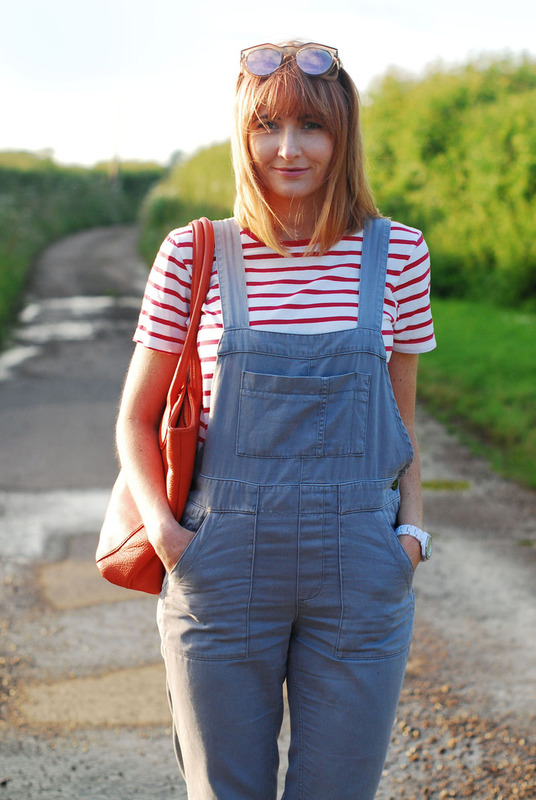 I am a huge fan of stripes and I think I may have to pull my overalls that I have kept for decades out! I know I've said it before, but I'm going to say it again. Your haircut is fabulous! Make sure to come on over to Style Nudge to link up on Shoe and Tell!! Thank you for hosting. Thank you so much for including me in your favourites this week. Love the pop of red you are wearing and the sparkly shoes. This week my bold patterns became a bit neutral together so I got a great pop of colour with my blouse. Yes! I seemed to have fallen into the color week! Ha, not that that is a problem. I love color and it does brighten the mood for me. My sister even said she needed to start to wear more color. This is a fun look! 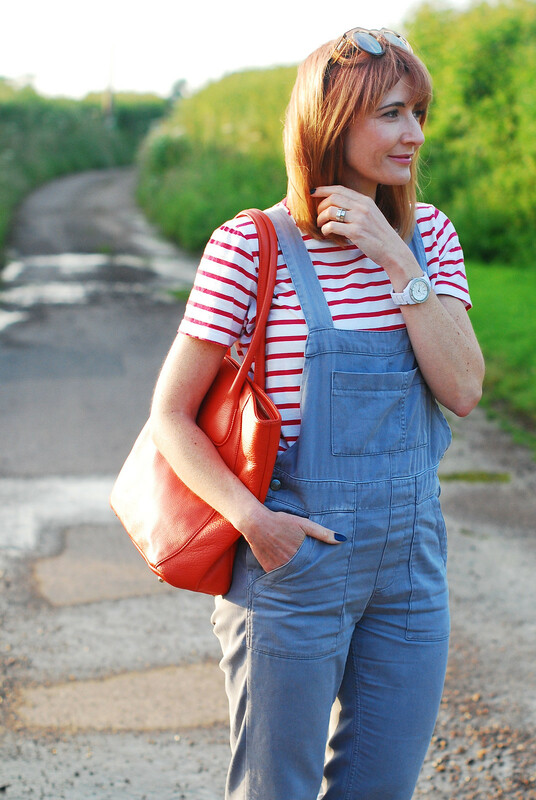 I like that the dungarees are grey and the pop of orange red with it is so cool! I am a big fan of slip ons, and between the more pointed toe and the shimmer, I dig those shoes! Superb sparkles! Where is that word comming from? Dungarees? Haha,sounds like dungeon! So I'm laughing because of course I'm a week late with the stripes! But at least I added a pop of color to my striped shirt—that should count for the theme for the week, right? I still haven't tried the dungaree trend as an adult, but I just came upon a picture of me in a pair from college days—so I guess I did wear them once! I love the sparkly shoes—I have a pair that seems to upgrade any outfit!! thanks so much for the linkup!! Thanks for hosting the link up and I hope you can pop by and check out my new weekly link up as well on Fridays! Have a fantastic day! Did you know its origin is Hindi? The Brits have a lot of great words of Hindi and Urdu origin, like bungalow, bandanna, shampoo, pyjamas… That's all I can think of at the moment, but there are loads more…! Love the bright pop of color! !